Marion and her mother inherit an old house, complete with a private beach. While they expect to have a good life at their new home, Marion soon finds strange rock carvings, a creepy lighthouse watchman and discovers local legends that seem to be coming to life. 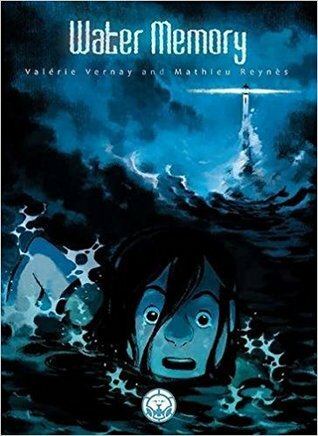 This graphic novel is translated from the French, and Valerie's art is lovely and full of details. The end of the book also includes notes from the author and artist, and sketches of the character design and the world-building after trips to Brittany for inspiration. Marion is a curious little girl, exploring the area around her house, the stones with faces that were set up, and even trying to go to the lighthouse despite stories from the villagers about the watchman. The story unfolds steadily, and we learn more about the village and its history. It's a simple overall story, in that there are no subplots and not too many characters to really complicate things. The focus is on Marion and the steps she takes to learn more about the village legends, and in the process we do, too. The book is likely to appeal to middle-grade readers as well as adults interested in the supernatural.